Byron & Byron Florentina Tiara range is a elegant and unique selection of wooden curtain poles. There is a choice of stunning metallic colours. 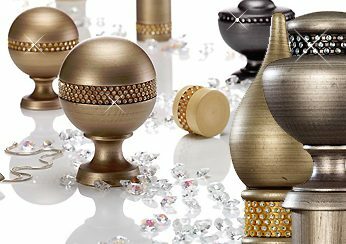 The finials on the poles have crystals, this will bring a look of magic and beauty to your room. Each pole is special, hand-made and finished by people with experience. Not only are curtain poles available in the diameter 35mm, but also a diameter of 45mm. Also, the poles can be on a cord or hand drawn. This will be how you would like the pole to look. A stunning range of Hold backs are available to purchase which with compliment the Byron & Byron Tiara range perfectly. Draw rods can also be purchased separately to add the finishing touches to your Byron & Byron look. Tiara range provides a selection of exquisite poles, and smooth functional tracks to remove the need for curtain pole rings. This gives you a stunning finished look with the curtain heading running closer to the pole itself. The Florentina collection is available in four different colours: Modern Gold, Dark Pearl, Satin Silver Black and Light Pearl. As a matter of fact, the Tiara collection allows you to choose from seven breath taking finial designs. All delicately decorated with crystals excluding the smooth classic ball finial. Additionally, a number of brackets including: Architrave, recess double and extended brackets are available in the collection upon request. All poles come with instructions and fixings. Furthermore, a choice of Metal brackets are available within this collection, colours available are Chrome, Brass and Antique brass finish. Lastly, please allow 10-14 working days for delivery as all Byron & Byron poles are hand finished and made to measure. Visit our website by clicking this link to find out more information on the Byron & Byron Florentina Tiara Range. Or contact us on 01915849002 to speak to one of our advisers.